Thousands of tech enthusiasts and industry insiders have been flocking to Berlin this weekend to find out about the latest developments in the world of consumer electronics at IFA 2018. Next to a slew of new smart home gadgets, consumers also got a first look at Samsung's first market-ready 8K TV, which will be available to affluent TV enthusiasts by the end of September. While it will probably take a while for 8K television to hit the mainstream, some previous "next big things" in tech have started to deliver on their promise. Among the big tech trends of the past years, 4K or Ultra HD TVs have been most successful in turning hype into actual sales. 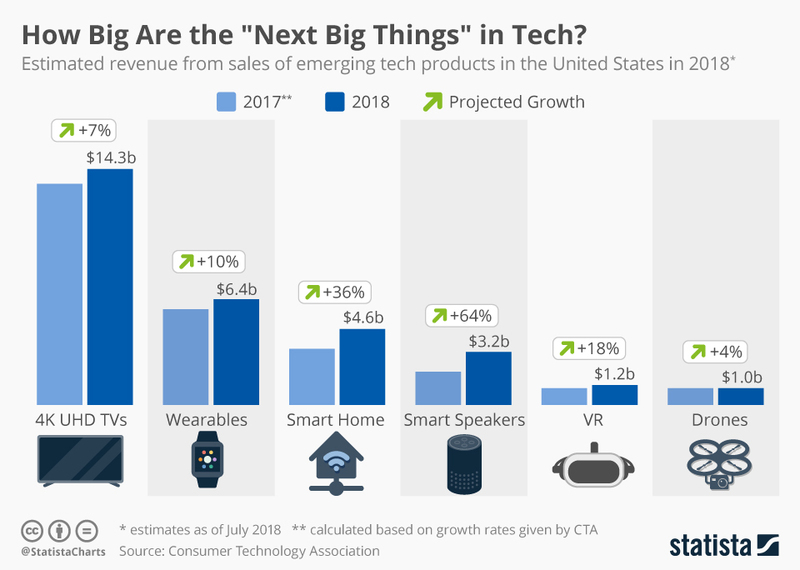 The Consumer Technology Association projects 4K TV sales in the United States to amount to $14.3 billion this year, leaving other emerging tech categories far behind. 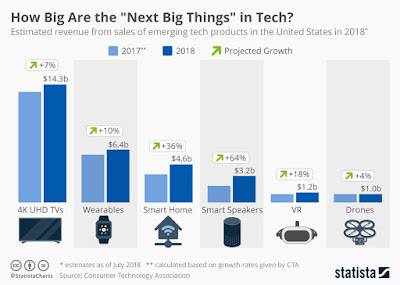 As this chart from Statista illustrates, smart speakers and other smart home products are also expected to see significant growth this year, translating into multi-billion dollar sales in both categories. Virtual reality headsets and consumer drones still lack that mainstream appeal but are expected to pass $1 billion in sales this year as well.